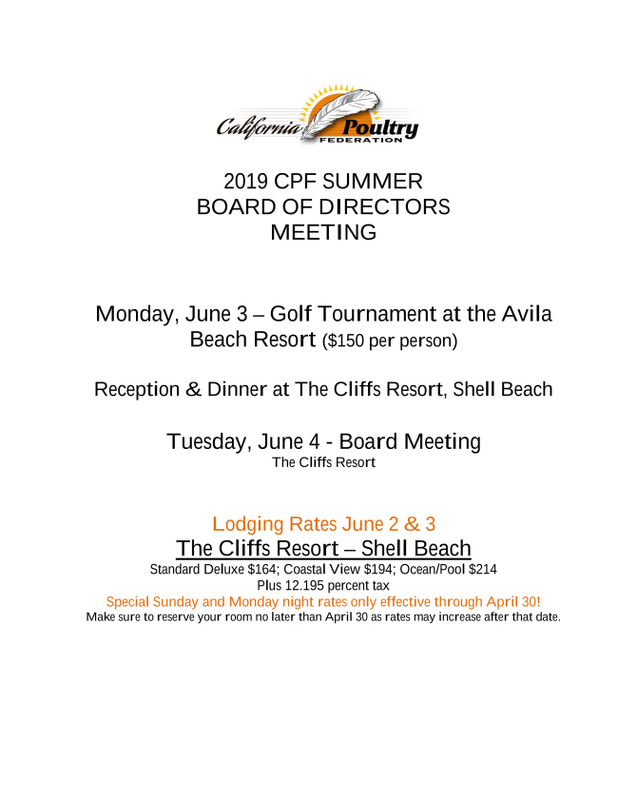 2019 CPF Summer Board Meeting and Golf Tournament! Tuesday, June 4 at The Cliffs Resort in Shell Beach, California. On Monday, June 3, our very popular golf tournament will begin at Avila Beach Resort at 9:00 a.m. An outdoor reception, golf awards and dinner will follow in the evening after the golf tournament at The Cliffs Resort, with beautiful views of the Pacific Ocean. Please contact the CPF office by April 30 to reserve your spot in the tournament and make your room accommodations. Phone Sandy at (209) 576-6355 or email sandy@cpif.org. Click here for more information. 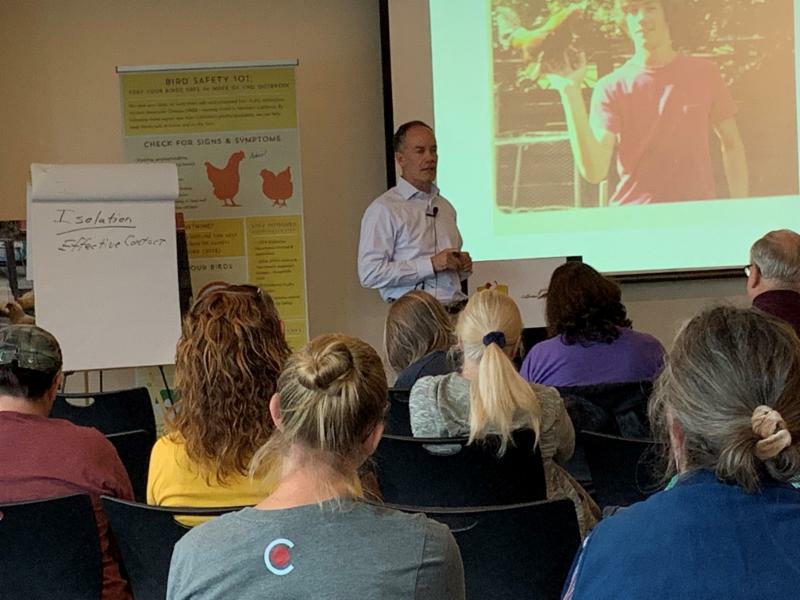 from the state of California (CDFA), academia (UC Davis) and private industry (Foster Farms) – along with nearly 100 urban farmers and backyard poultry owners – gathered in Dublin, California, to discuss ways to prevent further spread of the highly contagious Virulent Newcastle Disease (VND). Although only a single case was recently diagnosed in Northern California’s Alameda County and is no threat to human health, more than 1.1 million birds have been lost to VND in Southern California since May 2018, with additional cases confirmed just this past week. The poultry experts are urging preventative action to limit any further spread of this deadly avian disease. Spread of VND to California’s Central Valley could be catastrophic to local economies, farming communities and backyard poultry enthusiasts. The National Poultry Improvement Plan (NPIP) is a cooperative Federal-State-Industry mechanism for controlling certain poultry diseases. NPIP’s General Conference Committee made changes to NPIP program standards to keep in line with the latest science, technology and best practices. USDA is publishing these proposed changes to the program standards for public review and comment.